Today, Small Business sales and marketing teams need to streamline top of the funnel prospecting activities to engage quicker and more efficiently with leads. Smart organizations are taking advantage of Social CRM technologies to quickly identify and qualify prospects to move them into sophisticated nurture and marketing campaigns. 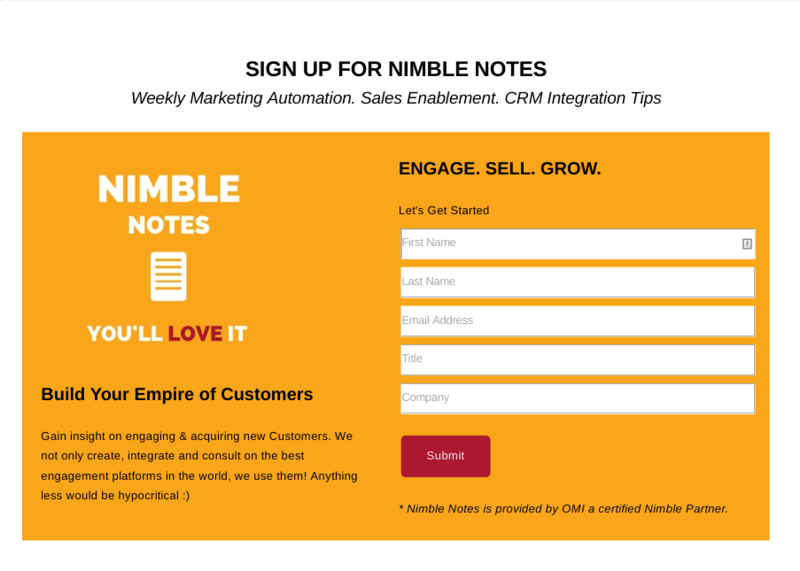 Industry leaders like Nimble are leading the pack for small agile businesses in the Social CRM space by disrupting the way sales teams prospect with lightweight browser intelligence services that provide detailed dossiers of lead profiles and personas simply by highlighting their email address. The Challenge, many sales professionals don’t reach the next phase of the funnel that require on-going nurture phases and conversion phases that drive actual sales. Sales efforts end up wasted sitting dormant in the CRM database and becomes stale or inactive over time. There is no surprise that 63% of traditional CRM implementations fail as a result. The harsh truth is, if you’re not pairing your CRM, Nimble, Salesforce.com or otherwise, with an effective marketing automation platform, you are not maximizing your investments in new business acquisition. A million leads don’t mean a thing if you can’t effectively drive relevant ongoing communications and actually convert prospects to leads and leads to customers across integrated channels. However, our 366 Degrees platform seamlessly connects to your Nimble Social CRM to transform your prospects into leads and in-turn build relationships that grow. One of the great prospecting and time savers of Nimble Social CRM is its capability to segment and sort your leads from one single page. By tagging information, adding notes, and tracking previous contacts, you can see your leads sorted into specific categories of your choosing. In 366 Degrees, you can easily connect these tagged categories and lists to drive effective automated outreach and nurture campaigns. Pairing 366 Degrees with Nimble takes only minutes and can be accessed through the 366 Marketplace and by adding Nimble Social CRM as a data source simply by connecting the two services. From there, you’re ready to take your prospect nurturing to a new level and tailoring the perfect marketing campaign to your Nimble Contacts, tags and leads. 366 Degrees paired with Social CRM frees the marketing and sales team to focus efforts on real time engagements and activities occurring in your nurture campaigns that find the best prospects to spend valuable time with. By clicking on the “Quick Campaign” tab and selecting email, you are now able to edit info like subject lines. All you have to do from there is select Nimble as your data source from a drop down menu to connect. Yep, it’s really that easy. From there, you go into the email editor and have the capacity to add variables to be filled in directly by Nimble such as location, job title, contact name, and company. 366 will dynamically fill these variables to fit the contact it was sent to. 366 allows for simple pre-formatted HTML templates to be dragged and dropped, without any knowledge of coding required. The final step to making those Nimble leads into meaningful relationships is selecting which Nimble audience or list you want these emails or automated nurture campaigns to go out to. Then, you simply click schedule, and your emails are on their way! Within the 366 Degrees platform, you can track lead interaction with your email and further push integrated campaigns to those who are interacting, or even send a follow up to those who didn’t open your email. 366 Degrees allows Nimble users to extend the power of social connections by handling areas that are more suited in supporting your sales efforts with added marketing areas that businesses need to deliver a full service marketing and sales stack like; the creation of landing and conversion pages to get further info and interaction with leads or easily manage your subscriber lists to personalize content to different groups or prospects. By easily implementing and automating CRM with 366 Degrees, you can drive newsletter sign-ups and nurture campaign seamlessly from CRM data sources including but not limited to lead source, lead type, tags or any custom fields related to the sales process. If you want to truly glean real value from your CRM platform, the only way to go about it is merging with a winning marketing automation program that can truly deliver results. If your CRM is Nimble, or even Salesforce, there is no easier or more streamlined platform for your small business than 366 Degrees. Featuring integration with social platforms like Google+, Salesforce Chatter, Facebook, Salesforce1 mobile and Twitter. Create winning content, email, social posts, landing pages and automate your sales and marketing processes today! 366 Degrees helps your Small Business Sales and Marketing attract, nurture, convert and acquire more customers. Combine Social CRM with 366 Degrees to build a revenue generating machine. Learn more today about pairing Social CRM and Traditional CRM with 366 Degrees. Visit the Nimble Marketplace or the Salesforce AppExchange. Your Small Business will enjoy more customers and make those bigger competitors a little more nervous.